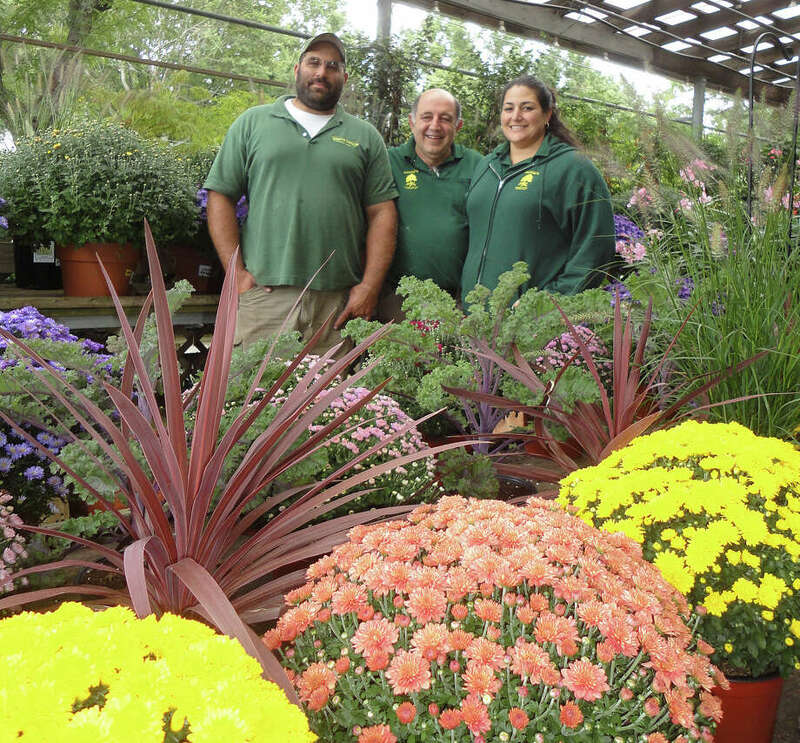 The Ganim's Garden Center and Florist family, from left, Austin, Lee and Merrilee Ganim pose at their business on Kings Highway Cutoff, marking its 75th anniversary this year. Lee Ganim considered studying law at the University of Connecticut in 1969, when he graduated from high school, and going into the legal profession like most of the rest of his family. Preferring greenhouses to courthouses, Ganim chose to dig his hands into the soil, rather than bury his head in law books. He earned a bachelor's degree in horticulture and followed the footsteps of his father, John Ganim, into a very different family business. The fourth-generation company -- which began as Ganim's Outdoor Market in Bridgeport and has evolved into Gamin's Garden Center & Florist LLC on Kings Highway Cutoff, is marking its 75th anniversary. In 1938, John Ganim opened the roadside stand at 650 North Ave. on the corner of North and Parrot Street in Bridgeport. The "Stand," as it was called, sold seasonal flowers for Easter and Mother's Day; produce throughout the summer; pumpkins, apples, cider and mums during the fall; and ended the year with the sale of Christmas trees, wreaths and cemetery decorations. "Ganim's Outdoor Market catered to an ethnic neighborhood. In those days, the neighborhood consisted of factories, dairies, a steel-covered diner and bakeries. The aroma of fresh-baked bread and breakfast items from the Mitchell Dairy Restaurant filled the air every day. Business -- and traffic -- was brisk," said Lee Ganim, known as "That Garden Guy" with a Sunday morning radio show on radio station WICC. The produce market was displaced in 1967 by the construction of the Route 8/25 connector. John Ganim found a suitable location in Fairfield at 320 Kings Highway Cutoff, where the market was expanded and the focus eventually changed from produce to live plants. In the early years at the new location, on the corner of Kings Highway Cutoff and New England Avenue, there was no building, just an open lot, and Lee Ganim remembers selling produce from pallets set up on milk crates. John Ganim brought in his father, Wanis Ganim, to run the retail operation while he went back on the road, hauling watermelons from down South to sell to mom-and-pop stores in the Northeast. Back then the company was largely a wholesaler of watermelons for Greater Fairfield and New Haven counties. "We'd bring in 100,000 watermelons a summer, 50 truckloads," Lee Ganim said. "We were selling seasonal plants. We had nowhere near the complex we have today. It was a small piece of property -- 20,000 square feet. Today, it's almost one acre with a greenhouse and irrigation system. And we added two floors to the building," said Lee Ganim, who is joined in the business now by his son Austin and daughter Merrilee. In 1999, Austin graduated from UConn with a degree in horticulture and expanded the family garden center into the residential and commercial landscape design industry. Merrilee, who got a business degree from Central Connecticut State University, added a full-service florist department for weddings, funerals and other occasions. The expansions were necessary to help their business keep up with the times, Merrilee Ganim said. The Ganims are proud that the business has survived for 75 years despite the relocation, competition from numerous garden centers and nurseries -- many of which are no longer in business -- and the more recent threats from big-box stores, like Home Depot, which opened down the street in 1990. John Ganim died the next year, but the business he established continued to thrive. "(Home Depot) did swallow up some of the local hardware stores, but we never let our guard down. We never looked at Home Depot as competition," Lee Ganim said. Rather, they viewed it as an opportunity to draw more crowds, expand the inventory, and carry plants and gardening supplies that the national chain does not. "We grow our own David Austin roses (a special, fragrant English rose)," Merrilee Ganim said. Lee Ganim added that Ganim's Garden Center & Florist carries more than 300 varieties of roses. "We're probably the largest rose distributor in Fairfield County," he said. Merrilee Ganim said the company expanded again in 2011 with another purchase of property from the Department of Transportation along Kings Highway Cutoff, allowing for installation of sidewalks to improve access for people with disabilities, as well as for customers to use carriages to shop for fruit trees, perennials, annuals, shrubs, trees, vegetables and herbs. The business also carries soils, fertilizers, mulches, seeds, deer repellents, insecticides, hoses, sprinklers and other garden-related products, including organic and chemical items. Pets are welcome to join shoppers, too. "People come with their dogs," Merrilee Ganim said.